High Resolution: No; Widget Ready: No; Compatible Browsers: IE11, Firefox, Safari, Opera, Chrome, Edge; Compatible With: WPML, WooCommerce 3.1.x, WooCommerce 3.0.x, Bootstrap 4.x; Framework: Underscores; Software Version: WordPress 4.8.x; ThemeForest Files Included: PHP Files, CSS Files, JS Files; Columns: 4+; Documentation: Well Documented; Layout: Responsive. GrowthPress has an integrated Page Builder which does all the heavy lifting for you. With its intuitive drag & drop interface, building pages becomes a pleasure. Change the look and feel of GrowthPress with the real-time preview WordPress customizer. See how your website looks before you make the changes live. The theme also includes many different page layouts that you can change via the Customizer (eg. front page layout, regular page, shop, blog, and more!). Create your own unique layout with GrowthPress's many custom widgets and sidebars. Do you want to sell your products online? WooCommerce is fully integrated with the GrowthPress theme, so you can quickly build your shop and start selling right away! GrowthPress supports most popular WordPress plugins by default. Contact Form 7, Custom Sidebars by ProteusThemes, WooCommerce and WP Featherlight are just a few of these. Plugins make WordPress so powerful and popular, make sure you pick the theme that allows you to unlock the full potential, not lock you in with just a short list of compatible ones. GrowthPress looks great on any device, from mobile to desktop and beyond. Our responsive design fits to any screen, and clean code means it loads fast too ЁC especially on mobile. Let people enjoy the fast experience they will have with your new website. And on top of that, Google loves fast pages too! Compatibility and code quality are as important as the visual appearance of the theme. Coded by WordPress Standards, GrowthPress is developer-friendly and easy to customize or add new functionality. The GrowthPress theme lays the groundwork for your business website. With GrowthPress at the heart, we guarantee your site will function well and look great ЁC both today, and in the future. 5 stars ЁC great mix of super design and very helpful support. I will be looking out for what this team creates in the future. They really know what they are doing. Well done. The content import via their server was the best I've seen in years. I normally have such a headache with the XML imports, so this is brilliant. The WordPress multilingual plugin can be configured for GrowthPress in minutes. All of our themes are 100% translation-ready. Want to use the images featured in the GrowthPress demo content? The images shown in the demo page are copyrighted and come blurry with the theme in the demo content. This doesn't mean you cannot use them . We're here to help, whenever you need it! Our first-class support team is ready to answer your questions ЁC so please get in touch with us via ProteusThemes Support if you have any suggestions or need help with any of our themes. Check the changelog for GrowthPress . GymPress - WordPress theme for Fitness and Personal Trainers; Readable - Blogging WordPress Theme Focused on Readability; MedicPress - Medical WordPress Theme for Clinics and Private Doctors; LegalPress - WordPress Theme for Lawyers, Consultants, and Financial firms; Bolts - WordPress Theme for Construction, Transport and similar Business; ConsultPress - WordPress Theme for Consulting and Financial Businesses; Extreme sports WordPress theme for outdoor adventure businesses - Adrenaline. Keywords: brand identity, business, content marketing, digital marketing, growth hacking, landing page, lead generation, marketing agency, online marketing, sales page, seo, seo agency, social media marketing, web agency, web design agency. 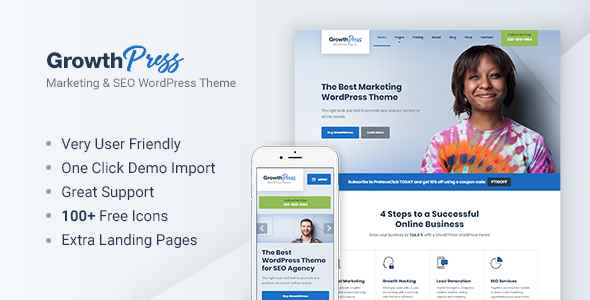 Premium ThemeForest GrowthPress Marketing and SEO WordPress Theme 20800102 WordPress Themes, Website Templates, Mobile Themes, Flash Templates & Scripts from creative professional designers. Full details of ThemeForest GrowthPress Marketing and SEO WordPress Theme 20800102 for digital design and education. ThemeForest GrowthPress Marketing and SEO WordPress Theme 20800102 desigen style information or anything related.